Your favorite lovable, dependable PAR series now includes UV! Meet the LB PAR™ CSI, a blacklight fitted with 18x super-bright 1W UV LEDs for intense ultraviolet wash and stunning blacklight strobe effects. The cherry on top? 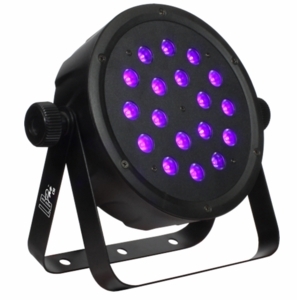 These fixtures are ideal for clubs, DJs, and mobile entertainers thanks to lightweight, durable scratch resistant composite housing, dual mounting brackets for flexible positioning, and a price point that doesn’t break the wallet. The LB PAR™ CSI’s 4-button LED control panel allows control of 0-100% UV output level settings, 0-20Hz strobe effects, user selectable 8/32-bit dimming modes for smooth dimming capabilities, and the choice of either 1-channel or 3-channel DMX mode selection. It also comes equipped with powerCON® compatible AC in/out and DMX in/out jacks.